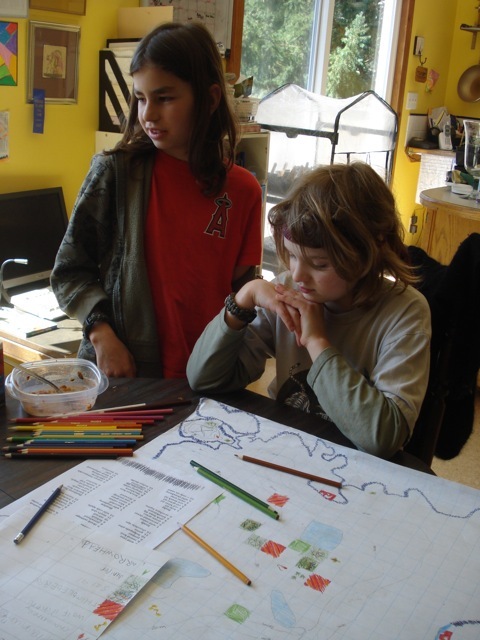 Our home schooling journey this past spring has somewhat exploded into new territories, both real and imagined. With the resources and creativity of a neighboring island teacher, principal, and outdoor education leader Steve Dunsmuir, our group has embarked on an adventure involving the discovery of an archipelago of islands that have never been explored before- because these islands exist within the imaginations of the kids. But as the children learn to shape these islands and dress them in plants and animals, they also learn the real life skills of living on these islands without the modern developments that we live with today. 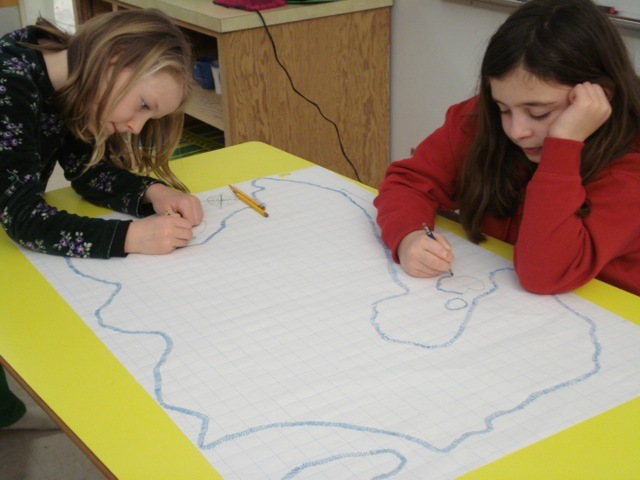 We grouped the kids into 4 island groups and gave them a large piece of paper and they worked together to draw the outline shape of their island. Then they traced that shape onto a piece of graph paper, and then the originals were placed on the wall of the room onto a big blue background, which then determined the directional placement of the island. 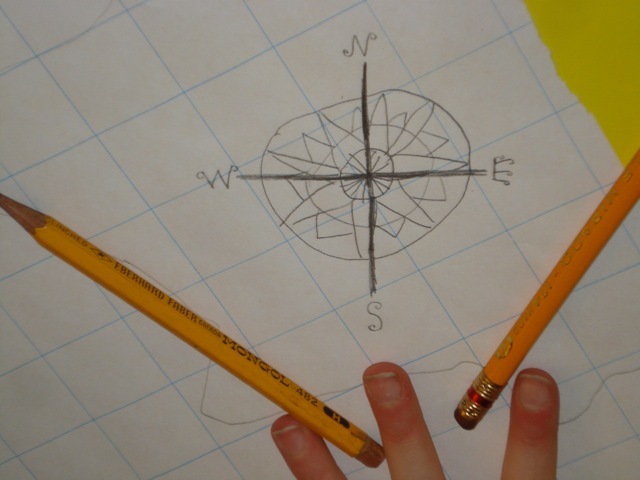 Each island now had a defined shape and a compass rose, and a proximity to the other islands. Then we rolled dice to give elevations and water ways. First roll was with a six die, and it determined how many high points there were, and then each high point was given an elevation with the roll of a 10’s dice. So if 4 high points were rolled, and then 60 was rolled, one of the high points would be 60 meters. The kids then worked together to decide where each of these elevations would go, in regards to the compass directions of the island. The same was done for lakes, and for rivers. 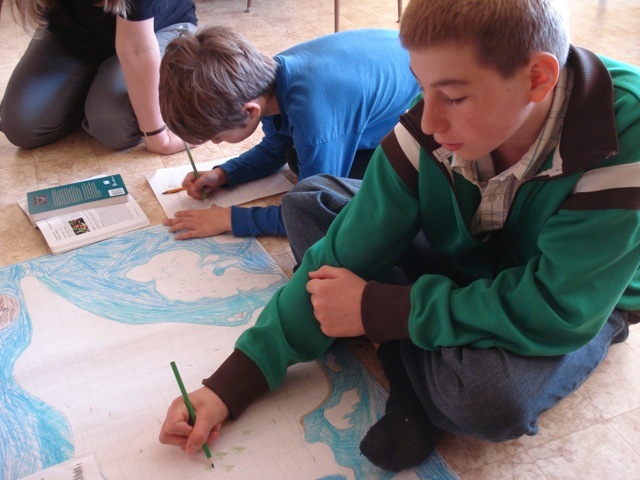 Eventually the kids learned to draw contour lines, giving visual dimensions to their new islands. We did a fun exercise of placing a large rock in a tub and pouring water on it, marking a line around the rock at each 6cm interval to show the changes in elevational contour. We determined, with the scale of 1 square=1 hectare, that the islands are about 3.5 kilometers long and 2 kms wide. That put a perspective when we compared it with the size of the island we live on. One day we all went out for a hike, walking a route that spans the length, and then hiking up a ridge that is similar to the elevations of the imaginary islands. They are not very big islands, but considering there will be no roads, paths or trails when we get there, they are just the right size for two or three kids to imagine exploring and gathering from every side of it. I haven’t mentioned yet the other imaginary aspect- characters. The kids all created their own personality- age, name, attributes, skills, and abilities. Some of the abilities and skills are real life learning experiences, and some are imaginary with a bit of research. 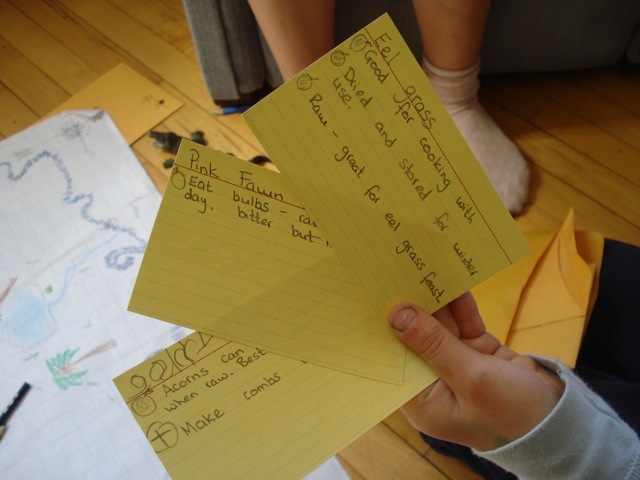 For instance, from a list of 100 skills, each child picked one for their character that they already have, one that they would like to learn, and one random one (determined with rolling dice). The one they want to learn is one they came either learn for real, or just research about it and present the information. Taeven picked cooking, and so we have embarked on a more exciting journey of learning to cook, something which was always a bit of a struggle before. Cedar picked archery, and lucky for him, Julie had already organized 4 weeks of archery lessons because most of the kids had requested earlier in the year to do archery. The kids also have a record of other attributes, such as endurance, balance, aim, and finding. They can earn greater points during our real life adventures for these attributes. We also try to offer this aspect of attributes on a personal level, so achievements are kept as a reflection of each child’s individual abilities. It is also light-hearted and fun, so we are not strict with our standards in any way. Often the kids will decide for themselves if they feel they have achieved a greater level of ability. Taeven and Cedar have been in the habit of awarding points to each other even! 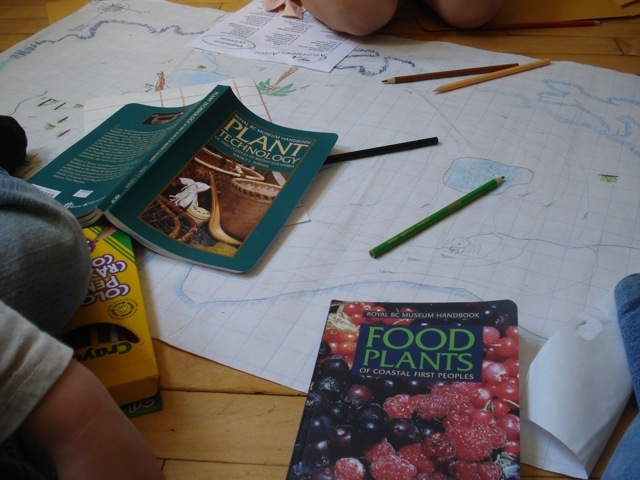 We spent a flurry of time and activity discovering all the plants that grow on these islands. 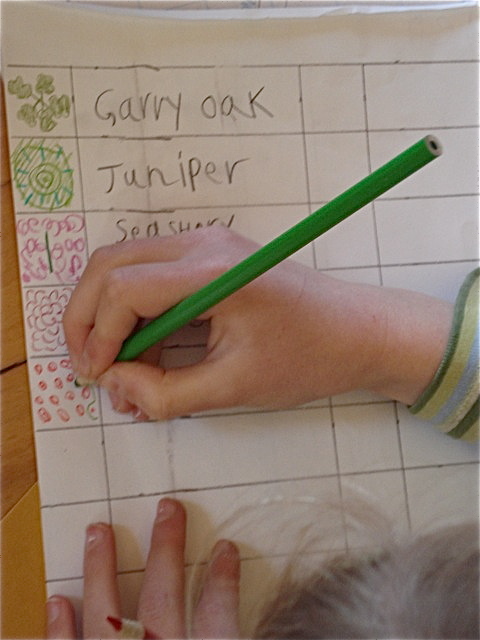 From a list of 100 native flora divided into groups of habitat, the children rolled dice to get a plant, then roll again to find how many squares of that plant they have. Then they decided where on their island that plant would grow, and a symbol would be created and added to a legend of all the plants on their island. The kids could then do additional research to find out how the plant could be used, either for food, shelter, water, transportation, safety, communication, first aid and medicinal, or happiness! The possibilities of going deeper into any area of this game is staggering. Because we only meet twice a week, and because our kids are all so diverse, we have taken a loose approach to each of the deeper explorations, leaving those who wish to learn more the chance to do so in their own time. Even just researching one plant can be plenty- Cedar has ocean spray on his island, and when he found out that the long, thin, strong branches were traditionally used to make shafts for spears, arrows, bows, as well as other structural uses, he went out and began crafting himself a harpoon. We had an afternoon of discovering the animals that live on these islands too, through more rolling of dice. Julie had a computer hooked up to a projector and was searching for photos of each animal as they came up around the room, giving the kids visual identification and opening opportunities for other “islanders” to share what they might already know about each animal. 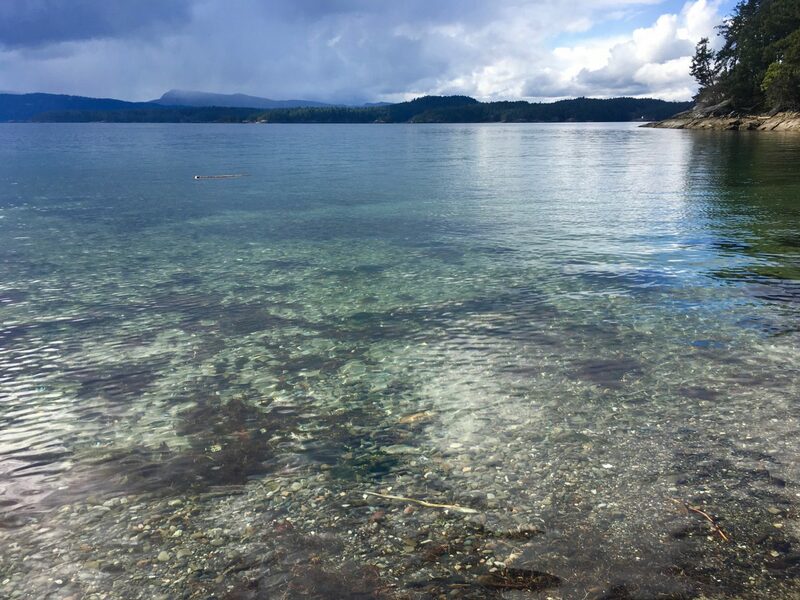 We learned that there are many different types of mussels, and that sea cucumbers can indeed be eaten, and we listened to the call of an oyster catcher. The kids kept track of their animal populations by placing them in appropriate habitats and creating a legend. We watched a slideshow of all the animals in the archipelago, and learned what lives on neighboring islands. That is where we are at so far with the Archipelago game. Soon we will be traveling to the islands and using our skills to set up a homestead so that we can enjoy the wild foods, the fresh water, shelter ourselves from the elements, and interact with neighbors, human and animal, with the best of both the imaginative world and the real world. From what I have observed, this game has created a sense of group unity amoung our 16 diverse children while celebrating their unique qualities. Their abilities to work together and share ideas while remaining individuals has created a beautiful atmosphere of positive energy in all the exciting activities we have taken on to complement the focused paper work of the Archipelago.